Batman has been one of the most popular comic book superheroes in the world, with the legendary Bruce Wayne starring in comics, movies, video games and more for over 70 years now. The DC Comics legend has most recently come back into mainstream popularity thanks to a trilogy of films created by Christopher Nolan. The second of those films was known as The Dark Knight, the name that had long been one of Batman’s major nicknames. The movie saw Batman (played by Christian Bale) attempt to hunt down the Joker (Heath Ledger) as the supervillain tries to cause chaos in Gotham City. That film became the setting for Microgaming’s The Dark Knight poker machine. This progressive jackpot pokie features sights and sounds that come straight from the movie and will excite fans of the Batman franchise. Of course, none of that would mean anything without great gameplay and huge prizes, and this is one machine that has plenty of both. 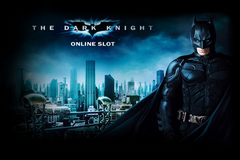 The Dark Knight is a five-reel online poker machine that features a 243 ways format. This is a popular structure for Microgaming pokies, one that allows you to pay a flat rate to gain access to every possible left-to-right combination of symbols on the reels. With five reels and three symbol positions on each, there are 243 possible combinations, thus giving the format its name. Players have the option to bet at different coin denominations and levels; while this can get a little convoluted when talking about 243 ways pokies, the important thing to know is that the maximum bet per spin is $6. As in most poker machines, the main object of the game is to match symbols from left to right across the reels. In most cases, you’ll need to match at least three of a kind in order to score a win. The smallest prizes come when matching card ranks from tens up through aces, while bigger rewards are available if you can match any of the iconic characters from the Batman series. Some of the biggest prizes are attached to Harvey Dent, the Joker, and (of course) Batman himself. The Dark Knight is filled with surprises, from special symbols to random bonuses that can appear at any time. First, there’s the Batman signal, which acts as the wild on this pokie. This symbol is stacked on each reel, meaning it is possible to fill entire reels with wilds. The wild symbol can even generate its own prizes: as the game itself likes to point out, you can win 4 million coins (or up to $80,000) if you fill the entire screen with stacked wilds on the same spin! The scatter symbol is provided by the Joker’s graffiti, and offers plenty of great rewards on its own. Hit two or more anywhere on the reels, and you’ll win an instant prize, one that grows depending on just how many you hit. Three or more of these symbols will also take you into a great free spins game. You’ll start with 15 free spins and a 2x multiplier that can grow during the course of the feature. Do you like being randomly awarded with prizes? If so, you should look forward to appearances by both Batman and the Joker during play, as they will occasionally show up to give out bonus prizes during and after spins. There’s no predicting when these awards will come, but it’s a fun addition that sets The Dark Knight apart from many traditional pokies. The most exciting part of The Dark Knight, however, may be the progressive jackpot bonus round. Like the random prizes, this feature could be triggered on any spin; only the amount you’ve spent on each spin influences your chances of randomly activating it (obviously, spending more money gives you a better chance of triggering the feature). Once you enter the bonus round, you’ll see a wheel that has the potentially to give you one of four prizes. You’ll have the option of choosing between Batman and the Joker, which will determine which position on the wheel will score for you. After you’ve made your choice, the wheel will spin, and you’ll be awarded a prize based on which colour the wheel stops on. The smallest prize – the Mini Jackpot – starts at just a few dollars, but the Minor Jackpot is worth hundreds, and the Major Jackpot is often worth $50,000 or more. And if the wheel stops on the one and only white spot on the wheel, you’ll win the Mega Jackpot, which is worth millions to the lucky player who captures it. If you are a fan of Batman or big prizes, this is a poker machine that you’ll definitely have fun playing – and if you enjoy both, this might just become one of your favourite pokies. The gameplay is fun, the presentation is excellent, and it is hard to beat the size of the progressive jackpot. If you want to give The Dark Knight a try, just sign up for an account at one of the many great Microgaming casinos that offers this machine.